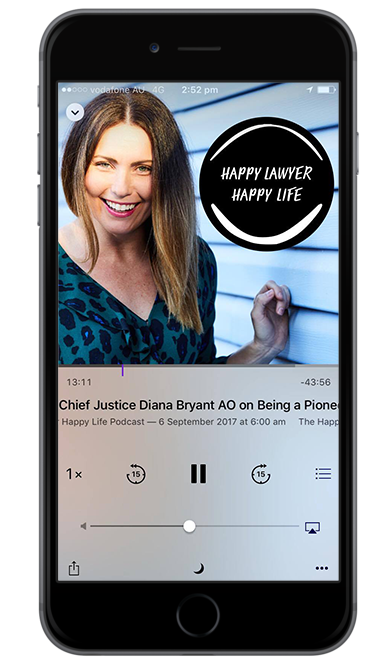 In this week’s episode of the ‘Happy Lawyer Happy Life Podcast’ I had the pleasure of interviewing the Dean of the law school at Griffith University, Therese Wilson. Having begun life (in law anyway!) as a commercial lawyer and fast making her way up the corporate ladder, Therese found herself having had children, reconsidering her path. An accidental position teaching has of course led to a wonderful career in academia and last year Therese took on the role of Dean of one of Queensland’s most successful law schools. The education of our future lawyers is a hot topic right now and as someone hiring students and grads in my firm I have come to know that Griffith students bring a different skill set to the role than others. I sense, having now had the chance to speak with Therese and better understand the ethos at Griffith, that it is a combination of practical learning, a desire to innovate and a focus on social justice that I am seeing come through in their students. I loved this conversation. Therese is clearly a talented and intelligent woman but it was her advice for lawyers at all stages of their careers that resonated with me. We discussed the importance of continual learning, of seeing all of life’s adventures as valuable and of course the importance of seeing opportunity in everything thrown your way. Whether you are a student, graduate or lawyer of many years I suspect you will take a lot from Therese’s wisdom on law and life in this conversation. If Therese was not a lawyer she would have been a journalist. Loving history, Therese was fascinated with legal history and it kicked off her love of the law. Choosing law in the first place- some advice for students. Being a western suburbs girl, Therese has lived in Brisbane for much of her life and the impact of her father’s legal career in her own career. As an employer, I have been impressed by the legal knowledge of the students coming from Griffith University and we discuss why this is. Creating a unique culture at Griffith University and how Griffith is starting to change the legal culture. Why compassion and empathy in our industry is so important. Starting out as an Articled Clerk Therese fast became an Associate but it was the arrival of her first son that had her questioning whether private practice and motherhood were even compatible. Therese’s observations about juggling our roles as parentings in the legal profession and her tips for managing the tension between our sometimes competing roles. The story of how Therese became the Dean of Griffith University. The importance of backing yourself, seeing opportunity in all areas of life and trying new things. The ill health of law students and Therese’s passion in supporting her students. The value placed on the GPA and our perspective as a Dean and an employer. When Therese is not being the Dean she loves to snorkle and values family time. The misinterpretation of work life balance. Learning to becoming flexible, along with balancing good work. The future of law and Therese’s predictions for the future. Sit back and enjoy this interview with Therese Wilson.